There's been an increase in traffic on the website which means it's a good time to ask all of you to look at the Chapter Grand and help us update the list of Brothers who have passed and have no information. For example, Brother Richard Reich #117 was able to provide a newspaper clipping of the obituary for Joe Barry Stephens #26 which allowed us to correct his information. Any help would be greatly appreciated. 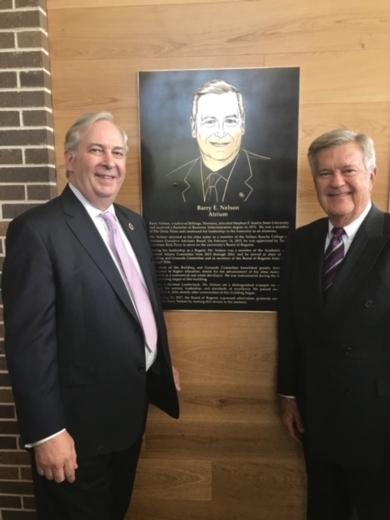 Read the newest "Sawdust" to see the compliments for Loddie Naymola #339 and Mike Hopkins #138, who graciously donated their resources to SFA, and in return, have their names on the Business building. The "Walter E. Naymola Innovation Hub," and the "Michael J. Hopkins Lobby" were announced by the SFA Regents in January. "Not only, not less, but greater than it was transmitted to me." No word yet on the PDT Hallway, where everyone lined up outside the dean's office at the start of the semester to try to get back into school! If you have the email address of a missing Brother all you have to do is locate the Missing Brothers box on the right hand column, Click Here, and follow the prompts. These Brothers have filled out their profile but haven't responded to my verification question. They're going on a year old now. If any of you are in contact with these guys please get a word out to them that I've sent several emails requesting they answer the very simple question that all the rest of you have provided. Here's a tip if your looking at the photos and memorabilia. When you choose and open an album, move the hand (mouse) over each choice and right click. That will give you the option to "Open in a new InPrivate window." In the new window you can increase the size of each picture to better identify the subject matter. For those of you who have contributed to this website, it would be a great help to the preservation of this chapter's history if you would take the time to provide the names of the Brothers, the year, the event and other individuals in the pictures. You know who they all are but many of us have no idea. Any help with this aspect of the library would be graciously appreciated. We have the Fredonia booked for July 26th thru the 28th. There are 28 rooms in the Terrace area where the new pool is. We have this entire area of rooms including a large outdoor TV area. I'm already fielding calls and emails. Book your room fast 936-564-1234. Phi Delt Golf Tourney. We have created this website for the purpose of consolidating our resources and to improve communications with both actives and alumni. Please be advised that this site is not associated with our national organization and that we are by no means trying to disconnect from headquarters. Our objective is to collect contact information on all Brothers who have been associated with the Texas Eta Chapter only. It is password protected for that reason and no information will ever be shared with any outside concern. If we were to try to work off our existing chapter role spreadsheet, of the 900 names listed, we would have less than 600 entries with relatively up to date contact information. We would appreciate all of you taking time to update your profile by clicking on the blue "JOIN HERE", and make sure you include your bond number after your last name in the detail section of your profile. It is our hope that this website becomes the link to many of you rekindling old friendships and our open invitation to join us for many future events. It would be a great shot in the arm for this website to have a significant increase in Brothers joining the site this year. As with any venture such as this, participation ebbs and flows. Make it a point to at least reach out to those in your pledge class that haven't joined us. If you look under the Brother Profiles tab above and see no icons after a name that denotes the individual hasn't joined. There may also be names that have been omitted. This is the result of working off the General Headquarter's list of Bond signers for Texas Eta. You may or may not convince some of the benefits of rekindling old friendships, but that unfortunately is expected. Give it the old college try. Texas Eta deserves your very best. 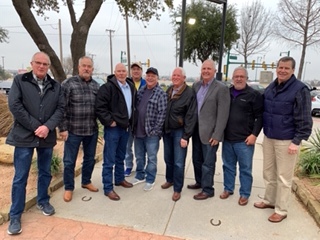 A group of nine Texas Eta Brothers met up in DFW this past weekend. Larry Sorsby #296 contacted some of them before Christmas saying he was flying in from New Jersey and wanted to see who could meet up for dinner. 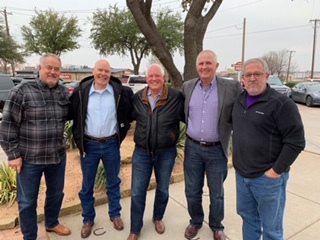 So Larry Sorsby, Bubba Hackett, Bob DeVoll, Scott Cook, Jim Stouffer, David Ash, John Cosby, George Clark, and John Kelly are the result of that call. L-R Clark #326, Devoll #294, Cook #295, Cosby #320, Ash #292, Sorsby #296, Hackett #298, Kelly #299 and Stouffer #286. Today my vintage 1967 Phi Delt Pen will be traveling to College Station. Tonight it will be used to initiate into the Texas A&M chapter Preston Still, one of my nephews...the oldest son of my youngest brother Joe. My parents had 5 sons and numbers one (me) through four, were all initiated at SFA, and (except for me) with this same pen. When Joe came along he decided to attend Texas A&M, which did not have a Phi Delt chapter. So he decided to just create one, which took two years. He was bond number 1 and the first president of the chapter. I used this pen to initiate him in that mid 1980's ceremony. Joe has two other younger sons, which will likely also be Aggies, So, I have decided to now pass the ownership of this pen to another generation. Since obviously I was not initiated with this pen then, theoretically speaking, it could initiate more family members at A&M (4), as it did at Texas Eta (3). This pen is also well traveled. It was also used 20 years ago, at the University of Tennessee, to initiate my brother Alan's (Bond #160..now deceased) only son Jonathan. Above in blue is the link to the KTRE report on the dedication ceremony for the STEM Building at SFASU. The ribbon cutting was attended by SFA Regent Ken Schaefer #140, SFA Regent Tom Mason #159 and Tom Heap #152. 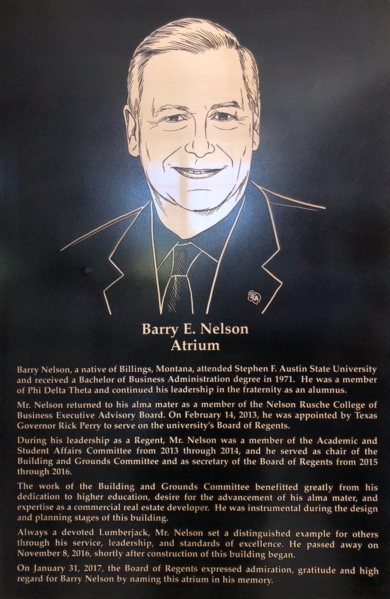 A plaque was placed in the atrium to recognize our departed Brother Barry Nelson #185. 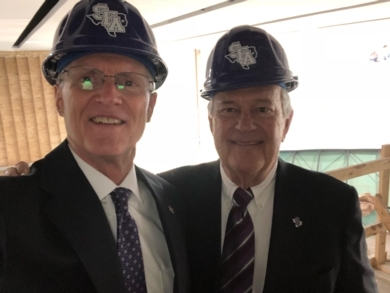 Barry served as the SFA Regent chairing the Building and Grounds Committee responsible for guiding the development and construction of the new Gwen and Ed Cole Building. Kingham Construction, owned by Brothers Jim Kingham, # 164, Tom Kingham, #262, and John Kingham, #303, handled all aspects of the project. 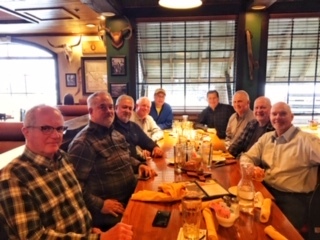 Brothers Jim Todd, Bond #133, Phil Broxson, #121, Bill Gandy, #96, Bill Livesay, #135, Tom Heap, #152, Ray Milentz, #153, Robert Leboeuf, #84, and Jim Dawson, #110, enjoyed getting together yesterday for lunch at Sam’s Boat. We had a great time catching up on travels, family and reminiscing of undergraduate days, including retelling of a few lies. 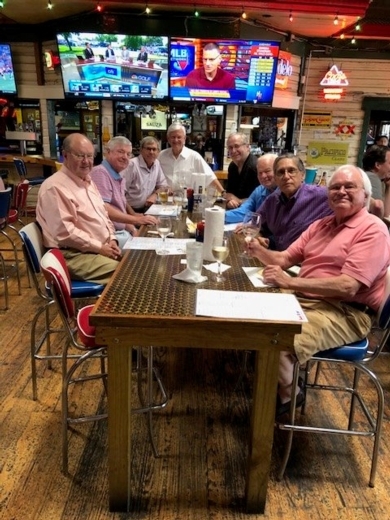 Phi Delta Theta brought us together at SFA and fostered these lifelong friendships. We hope others will join the camaraderie at one of our future lunches. 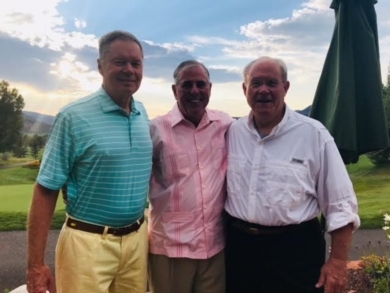 Jim Kingham #164, Fisher Trigg #209 and Robert Townsend #154 catching up in Colorado. Welcome to the Texas Eta website : The site has been developed for the entire chapter to enjoy and hopefully participate. It will be continually changing with your input, so don't hesitate to supply your ideas. All reasonable suggestions will be reviewed and implemented if at all possible.